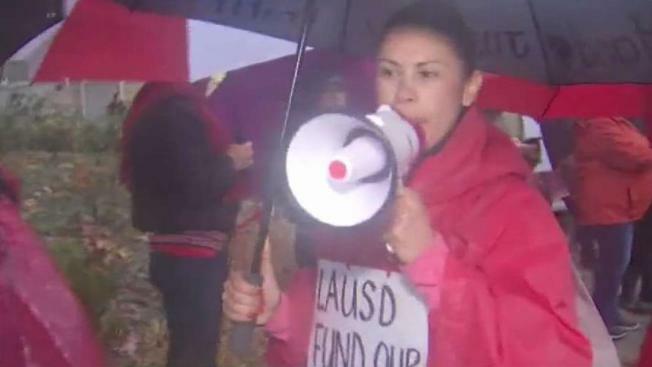 Teachers walked rainy picket lines Thursday at Los Angeles schools for a fourth day ahead of a new round of contract negotiations that a union leader said is unlikely to quickly end the walkout. Kim Baldonado reports for the NBC4 news at 6 p.m. on Thursday, Jan. 17, 2019. Thousands of teachers continued picketing at Los Angeles-area schools Thursday as negotiators for the teachers' union and Los Angeles Unified returned to the bargaining table, but there was no word of immediate movement toward an end to the four-day-old strike. "We should be aware that we've been at this for 21 months and there are some very fundamental issues that there are key differences on," United Teachers Los Angeles President Alex Caputo-Pearl said at a late-afternoon news conference. "An agreement is not going to take shape overnight. It's not going to be a quick and easy process, but today there's been good and hard work done." The LAUSD issued a statement late Thursday saying, "We need to resolve this as soon as possible to get our kids back in school and educators back in the classroom." "Our students are missing out on the opportunity to learn," according to the district. "Families count on us to keep their children safe and cared for, so they can continue to work to provide for their families. We need to end this strike now. "... This is an historic moment in Los Angeles as many more people are engaged in the conversation about the importance of public education. We need smaller class sizes, more support for our students and educators, including more nurses, counselors and librarians in our schools. We hope this passion and commitment our community is expressing will continue as we work together for more funding in Sacramento, where 90 percent of our funding comes from." Thursday's negotiating session was arranged in part by Mayor Eric Garcetti, with an assist from state Superintendent of Public Instruction Tony Thurmond. Caputo-Pearl said he met with Garcetti and LAUSD Superintendent Austin Beutner Thursday morning prior to the midday negotiating session. UTLA is planning another large rally at Grand Park next to City Hall on Friday. Thousands of UTLA members rallied at the park on Monday, the first day of the strike, before marching through downtown to LAUSD headquarters. The two sides have not met since last Friday, when the union rejected the district's latest contract offer. The teachers went on strike Monday, calling for increased pay, smaller class sizes and the hiring of more support staff, such as nurses, counselors and librarians. Beutner said Tuesday the district has offered the union as much as it can given its financial constraints. He said the union's demands would cost billions of dollars and bankrupt a district already teetering on insolvency. "It's just math," he told reporters. "This is just math. It's not a values conversation. The experts have all said we do not have the ability to spend more than we're spending." Beutner's position took a slight hit from within the LAUSD on Wednesday, when two Board of Education members issued statements expressing frustration with the continuing work stoppage. One of them criticized Beutner for failing to broker a resolution and accused him of spreading misinformation. "I can no longer allow Mr. Beutner to speak for me or to suggest that the massive public relations, and often misinformation, campaign that he is waging represents my views about the current teachers strike," board member Scott Schmerelson said. "We need to end the strike and get back to our teachers teaching and our kids learning. "... Instead of repeating the doom, gloom and heading for bankruptcy predictions that we have heard for decades, I believe that it is Mr. Beutner's job to honestly identify sources of funding buried in our existing budget, and the revenue growth predicted for next year, that could be creatively sourced and invested in the students ...," he said. "We all agree that the state must allocate more money for public education," McKenna said. "That should have been a legislative priority with a full-court press a year ago, not last week. If we expect teachers to do everything in their power to avoid a strike, then we have an obligation to do everything in our power to do the same." The district's most recent offer to the union, made Friday, included the hiring of 1,200 teachers, capping middle and high school English/math classes at 39 students, capping grades four through six at 35 students, maintaining all other existing class sizes, adding a full-time nurse at every elementary school and another academic counselor at high schools. "This represents the best we can do, recognizing that it is our obligation to provide as much resources as possible to support our students in each and every one of our schools," Beutner said Friday. UTLA officials said the offer did not go far enough to bolster school staffing, reduce class sizes and prevent them from increasing in the future. The union also blasted the district's staff-increase proposal for being only a one-year offer, and contended the district's salary increase proposal is contingent on benefit cuts to future union members. The LAUSD has offered teachers a 6 percent raise spread over the first two years of a three-year contract while UTLA wants a 6.5 percent raise that would take effect all at once and a year sooner. The district claims the union's contract demands would bankrupt the LAUSD, but the union disputes that contention, pointing to what it calls an estimated $1.8 billion reserve fund and insisting the district has not faced a financial deficit in five years. The district contends that reserve fund is already being spent, in part on the salary increase for teachers. The second-largest school district in the nation, the LAUSD covers 710 square miles and serves more than 694,000 students at 1,322 schools, although 216 schools are independent charter schools, most of which are staffed with non-union teachers unaffected by the strike. The district says about 500,000 students are impacted by the walkout. The district hired 400 substitutes, and 2,000 administrators with teaching credentials have been reassigned during the strike. The district has set up an information hotline for parents at (213) 443-1300. With the strike lingering, attendance continued to plummet. According to the district, only 83,928 students went to class on Thursday, although numbers were still being compiled from 10 campuses. That represented the lowest attendance of the four-day-old strike, down 37 percent from Wednesday, when 134,724 students reported to class. District officials said the absentee rate over the four days of the strike has translated to a gross revenue loss of about $97 million in state funding, which is based on daily attendance. The loss is partially offset -- by roughly $10 million a day -- due to salaries that aren't being paid to the striking teachers. Beutner estimated earlier this week that the district suffered a net loss of roughly $15 million on Monday alone. The district sent a letter to parents this week, noting that state law "does not excuse absences in case of a strike and students are expected to attend class," adding that "schools will not be notifying parents of absences, but will continue to monitor student attendance and provide support to students on an individual basis. Student absences during the strike will not impact graduation."